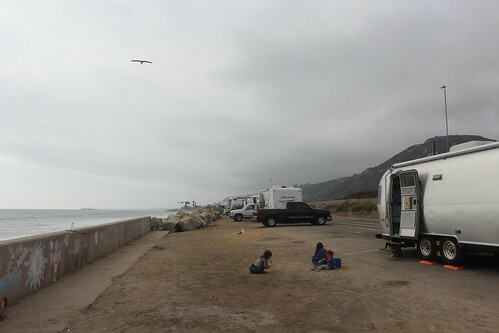 Mali Mish - Day 2: Beach Camping and the Ventura County Fair. The girls are old pros at traveling on the road and so is Luka. Even though he was only 3 months old when we left for our last cross country trip, he has spent over 5o% of his life in the Airstream and is completely comfortable with this living arrangement. But what is throwing Dan and I off a little bit is that this is the first time we are traveling with a emerging toddler. Ava started Airstreaming at 2. Mila started at 5 months and then continued again at 2. 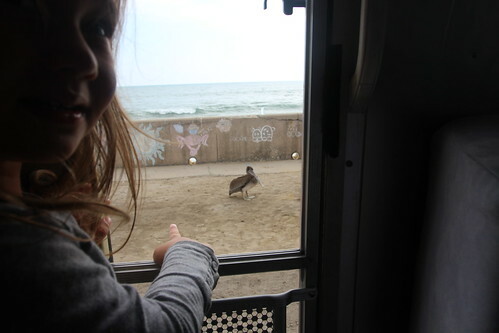 We somehow skipped living in the Airstream with the girls while they were one year olds. Oh man, is life different in here now! If you ever come into our Airstream and wonder where all the knobs are for the stove, you know now. 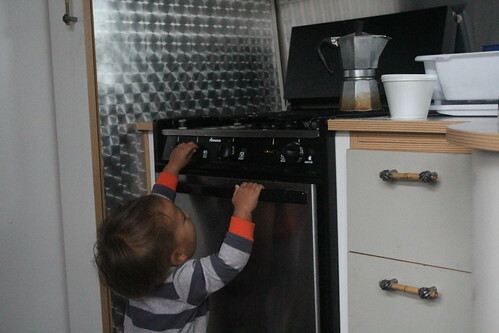 They are hidden away from this curious little guy… even though it is a little bit tempting to teach him how to make me a mean espresso! In the morning, we bid Dan farewell as he took the bus to Santa Barbara to spend a day in corporate America. 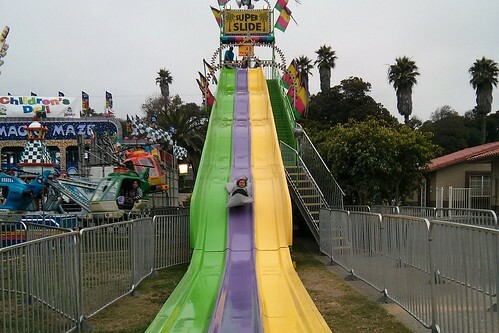 The kids and I decided that we were going to tackle the Ventura Country Fair today. After all, it was dollar day Wednesday. 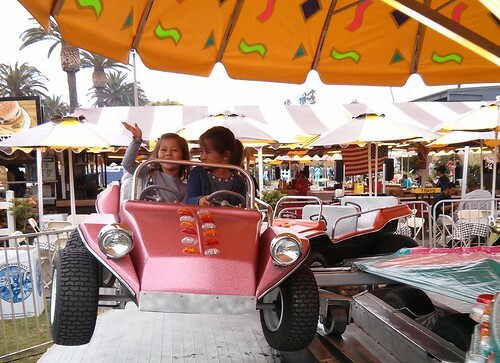 First up, the kiddie rides. 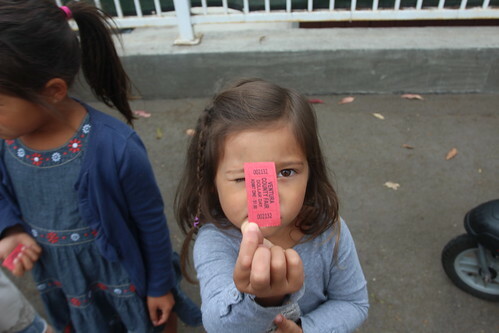 We showed up to the fair before it was even open. 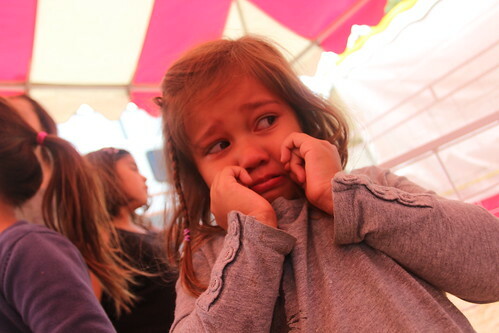 The first hour of the fair is always my favorite time of our visit. No lines, no crowds, no problems. The super slide is Ava’s favorite ride so she was pumped to be able to go it. Mila was surprisingly tall enough to go also so she happily tagged along with her big sister. But it turns out, being a tall 3 year old is not always the best thing. 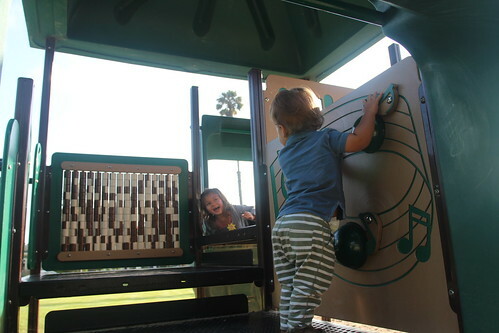 She was physically ready for the slide but mentally, not so much. Let’s just say there were tears. Lots of them. 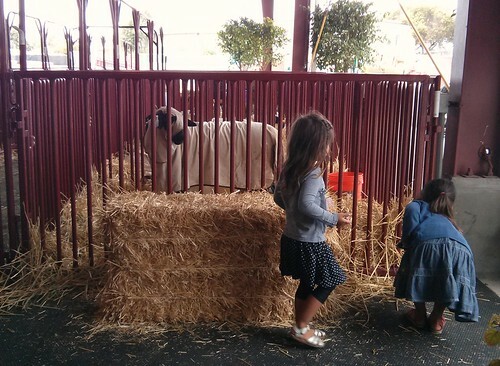 Next stop, the petting zoo… and more tears. As it turns out, those cute baby deer like to chew on dresses and skirts. The girls are no longer fans of bambi and now this mama needs a beer. So… change of game plan. Let’s visit the caged animals instead. Can you someone please tell me why some sheep wear these white covers. It can’t be because they are racists, right? 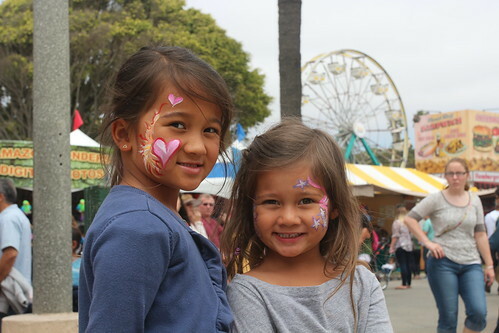 The girls got to pick one special treat at the fair: a pony ride, cotton candy or face painting. Thanks for not crying anymore, little ladies! Besides the scary deer and slide, the kids did really great. The girls walked for 4 hours without a single complaint and Luka was content in the baby carrier. 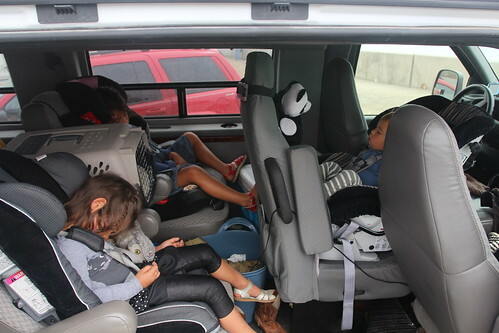 By the time we got to our van and drove home to the Mish, all three were zonked out. That’s called ‘MAMA WINS!!!’. Access to the beach from the sites here is a little tricky because you have to scale those large boulders a few feet down to get to the sand. Since I am the clumsiest person I know, it is safer for us to play in this dirty sand than it is to scale the rocks to play with clean sand. Look who came to visit us at our campsite today? A brown pelican. We usually get gulls hanging around our site but never a pelican. So that nap all the kids took earlier? You know the one I was bragging about? 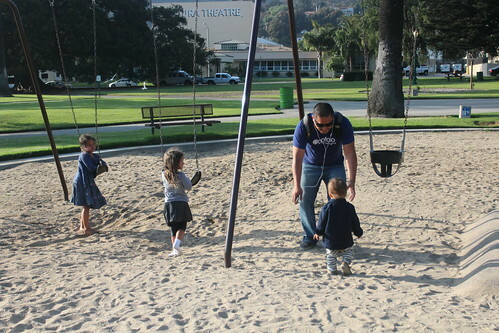 Well it turns out it re-energized them so off to the park we went. I love watching them play together, especially now that Luka is old enough to start playing the girls. 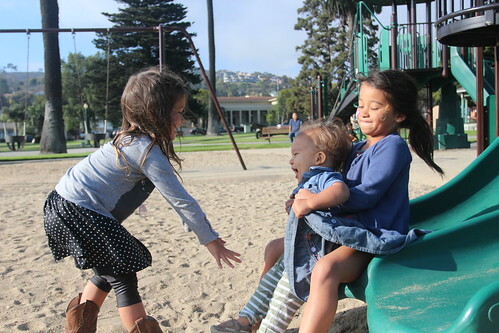 One of the main reasons we travel as we do is we want the kids to have a super strong sibling bond so moments like these make my heart smile. And look who is finally back? Daddy!! Thank goodness!!! 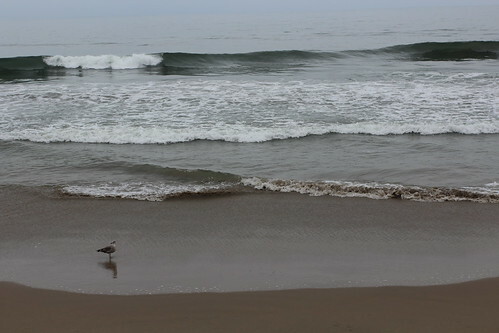 Tomorrow we will say good-bye to our old hometown of Ventura and head north. The Pacific Northwest is calling. Day 1: LA to Ventura with a Stop at the Proutys.